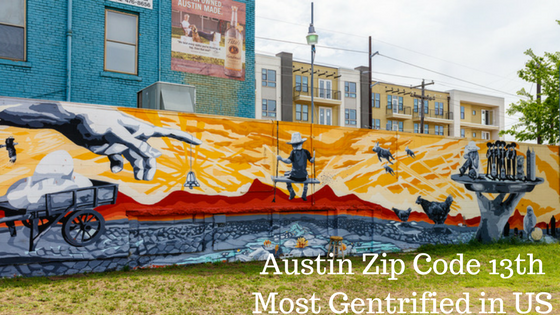 78702 in East Austin is one of the most gentrified zip codes in the nation according to an analysis by RentCafe, reports Culturemap Austin. Homes in the area, which includes the East Cesar Chavez, Holly and Chestnut neighborhoods, increased in value by 212 percent from 2000 to 2016. The percentage of the population with a bachelor’s degree went up 201 percent and household income went up by 47 percent. This rapid increase in wealth landed 78702 in the 13th spot on the list. Houston had two zip codes on the list. 77003 in East Downtown was in the number 3 spot with a home value increase of 284 percent. 77007, which includes Rice Military, Memorial Heights, and parts of the Washington Corridor, ranked 19 on the list. Household income in that area went up by 114 percent. Coming in at number 6 on the list, 76102, which includes downtown Fort Worth, had a 323 percent change in home prices, 103 percent increase in household income, and 122 percent increase in residents with Bachelor’s degrees. Austin’s decrease in affordable housing can be frustrating, and that’s why you need someone who knows Austin’s rental market on your side. Call Apartment Specialists South Austin at 512-912-8000 for absolutely free help in finding an apartment that fits your budget and your lifestyle.